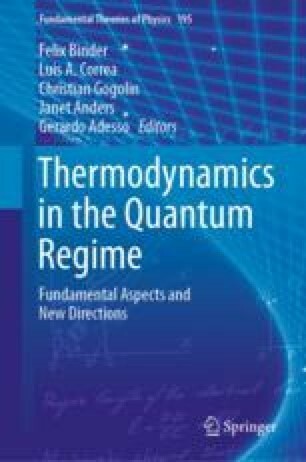 We present an overview of the reaction coordinate approach to handling strong system-reservoir interactions in quantum thermodynamics. This technique is based on incorporating a collective degree of freedom of the reservoir (the reaction coordinate) into an enlarged system Hamiltonian (the supersystem), which is then treated explicitly. The remaining residual reservoir degrees of freedom are traced out in the usual perturbative manner. The resulting description accurately accounts for strong system-reservoir coupling and/or non-Markovian effects over a wide range of parameters, including regimes in which there is a substantial generation of system-reservoir correlations. We discuss applications to both discrete stroke and continuously operating heat engines, as well as perspectives for additional developments. In particular, we find narrow regimes where strong coupling is not detrimental to the performance of continuously operating heat engines. G.S. gratefully acknowledges discussions with J. Cerrillo, N. Martensen, S. Restrepo, and P. Strasberg and financial support by the DFG (GRK 1558, SFB 910, SCHA 1646/3-1, BR 1528/9-1). A.N. would like to thank D. Newman, F. Mintert, J. Iles-Smith, N. Lambert, Z. Blunden-Codd and V. Jouffrey for discussions. A.N. is supported by the Engineering and Physical Sciences Research Council, grant no. EP/N008154/1. where the second equation just encodes the first at \(-z\) and is therefore not independent. where \(\omega >0\) is assumed throughout.